Each year the Vass Lions Club partners with local schools to collect canned and dried food. Residents of Vass, Lakeview and the Woodlake community also pitch in. 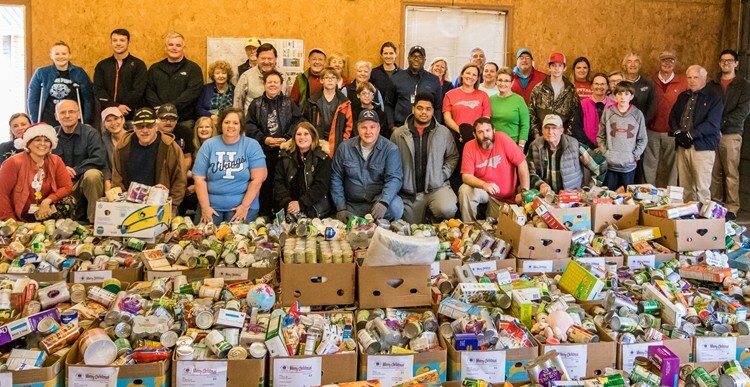 The end result is the accumulation of many tons of food which is supplemented by fresh items purchased by the Lions Club, baked goods donated by area grocers, sweet potatoes from a local farmer, and frozen chickens purchased or donated by individuals and the Lions Club. On the morning of Dec. 23, large boxes of food and toys are distributed by Lions Club members and other volunteers to needy families in the surrounding area. In 2018, 200+ families and 950+ individuals were served by this project. 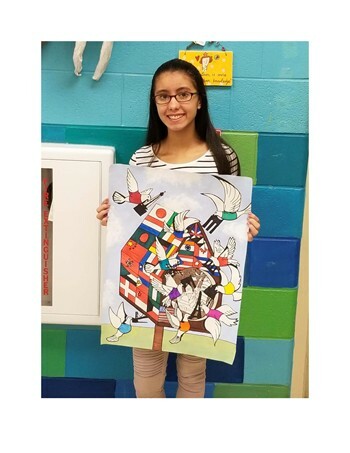 District Entry - Theme was "The Future of Peace"
(Vass, NC) – Nadia Sosa, a student at Crains’ Creek Middle School, has taken the first step to becoming an internationally recognized artist by winning a local competition sponsored by the Vass Lions Club. Sosa’s poster was among 600,000 entries submitted worldwide in the 30th annual Lions International Peace Poster Contest. Lions Club International is sponsoring the contest to emphasize the importance of world peace to young people everywhere. Since her school win, her art has received the District o First Place and the North Carolina State Division 1st Place. She has placed in the top 23 with the Big Show with International. The Vision Van, Staffed by the NCLF, Lions Volunteers and Local Doctors is Always Welcome! 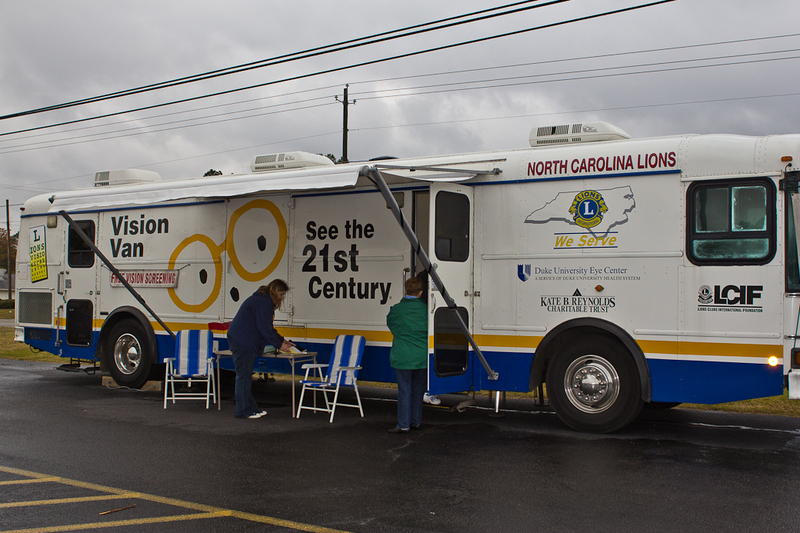 Once each year the Vass Lions Club provides a free eye screening clinic utilizing a state of the art traveling van owned by the North Carolina Lions Foundation. Area optometrists volunteer their time and Lion volunteers take care of the lesser skilled tasks. These include operation of visual acuity and visual field analyzer machines, and the organization and operation of the clinic itself. Invariably, at each clinic a number of people are discovered to have serious eye problems requiring treatment, and that is why we do it. The Vass Library was carved out of the old Vass movie theater using funds raised within the community. It has become a valuable asset to area residents, but is still very much in need of continued local support. The Lions Club has been one of its benefactors by providing funds for purchase of furniture and other equipment. The children's bookshelf pictured above was one of several items purchased with Vass Lions Club donations. Donated by Phillip Keith & family, the building serves as a Veteran's Memorial for veterans of all wars. Phillip was a helicopter pilot in Viet Nam. The Lions Club supports our local schools in a variety of ways. We have mentioned our scholarship program, but Lions also sponsor a high school version of a civic club, known as a Leo Club, and make annual donations for other important school needs not funded within the school system. Several grants are made each year to the schools in our area. Lion Rich Kirschke is shown presenting a grant to Vass Lakeview Elementary. Each year the Vass Lions Club awards college scholarship grants to deserving seniors at nearby Union Pines High School. Awards are competitive and based on financial need, civic responsibility, and scholastic merit. Application for a scholarship may be submitted by any senior planning to attend a college or university. A panel of Lions Club members evaluates the applications and determines who is to receive the awards. In this coming year two students will be selected. Each will receive $1000. 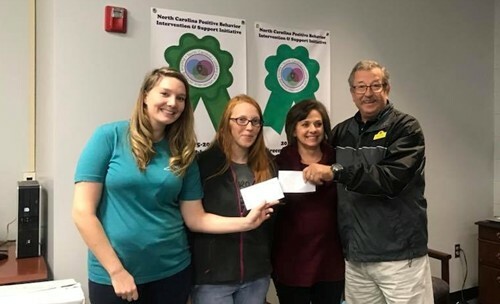 One of our Charter Members was a Founding Member of the Vass Rescue Squad, A.G. Edwards, Sr.
For years the Lions Club has provided regular support to the Vass Rescue Squad. Money has been used for various items of personal and rescue equipment. In our community, the rescue squad has a particular importance since it is mostly volunteer. Typically, $1,000 or more annually is donated with some added donations for special projects. The included picture is of helmets given in memory of Phil DeLozier, a longtime member of the Vass Lions Club and associated in everyone's minds with all things in Lionism. The Circle V Fire Department, Vass Fire Department, Cameron Fire Department and Vass Rescue Squad are now merged as the Cypress Pointe Fire and Rescue Department. The goal of our school garden is to get more students engaged in the hands-on activity associated with a garden as well as the learning opportunities presented by the garden. We would like to use the garden as a foundation for students to get interested in weather patterns, soil and water conservation, scientific observation, data gathering and graphing/reporting and ecology in general. We have a program now where all grades Kindergarten, Lower Elementary, will have some hands-on experience with the garden and also receive in-class education on plants, growing seasons and gardens pests. The older students will be asked to monitor rainfall, temperatures and track the information for the younger students to see and learn from. The Vass Lions Club has supported the Back Pack Pals Program at Vass-Lakeview Elementary School for the past several years. BackPack Pals, a program of Moore County Schools, started with one school in December, 2005. Eleven more schools were added in 2006 and three in 2007. The program was created to provide nutritious foods to children identified by school staff to have little or nothing to eat over the weekend. Children in primary, elementary and middle schools are recognized with input from teachers, teachers assistants, school nurses, counselors and other social workers as candidates for the program. Once the identification process is completed letters are sent home to obtain permission from the parents/guardians for the child to participate. Backpacks are then issued to the student free of logos maintaining the dignity and anonymity of the participants.